100% waterproof and designed to fit easily over shoes, our Slush Boots provide comfort and durability for use in muddy, wet, and snowy conditions. Slush Boots feature a cross-rib outer sole for greater traction and designed to reduce slipping. They're made from 100% natural latex for longer wear and enhanced comfort. Designed to be worn over work shoes, Slush Boots have a wider throat to make it easier to slide them on and off and feature a lining that resists tearing. A side strap and buckle at the top of the boot can be adjusted to prevent any unwanted material from slipping down into the boot. Choose from black or yellow color. Select a Slush Boot size two sizes greater than your normal shoe size for optimal fit. Ideal for use in farms, construction, cleanroom environments, food industry, laboratories and more. 100% waterproof and designed to fit easily over shoes, our Slush Boots provide comfort and durability for use in muddy, wet, and snowy conditions. 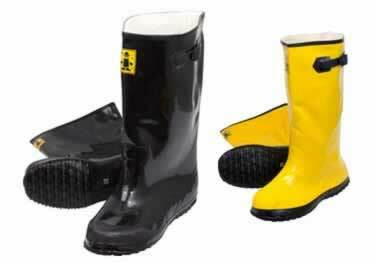 Slush Boots feature a cross-rib outer sole for greater traction and designed to reduce slipping. With a built-in fluid application feed, a heavy-duty cleaning tool that''s 100% waterproof with a 10'' telescopic handle.